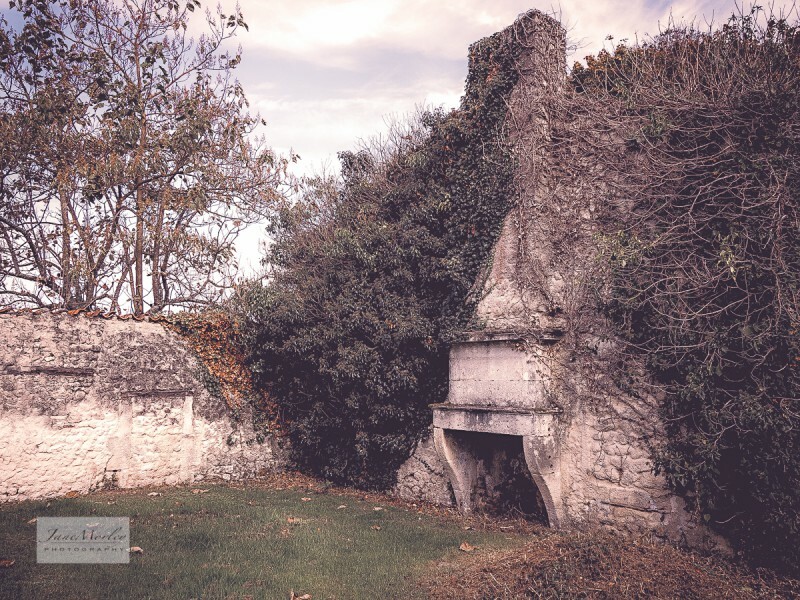 When we moved to France a few years ago, one of our projects was to be the restoration of a rather dilapidated cottage – the former caretaker’s cottage – in the grounds of our house. At the time the cottage was already in a state of poor repair but it did at least boast a roof and being typically optimistic English people with some experience of renovation we did not consider the task beyond us. One night shortly after our arrival we were woken by an extraordinary sound like a thousand large marbles rolling off a tin tray, the source of which we discovered the following morning was the roof of our cottage collapsing inward and the sound of all the tiles slipping from the rafters to the ground below. What had seemed at first to be a reasonable project had suddenly disappeared into the distant future and now required the proceeds of a small lottery win. I calculated today that if I manage to sell 25,871 greeting cards or 2,031 prints in the near future, the project may still be on……….. luckily I remain an incurable optimist. The cottage itself remains remarkable for 2 extraordinary reasons – the first because it has a beautiful Charentaise style fireplace complete with limestone lintel and chimney-breast on the outside of the building and secondly because mother nature, in her infinite wisdom and artistry, has woven a design of golden leaves and intricate ivy forms around the facade, of the most extraordinary beauty. Maybe we’ll just leave it as it is…………….. I thought this might be an interesting addition to this week’s Weekly WordPress Photo Challenge on the theme of Extra-ordinary. 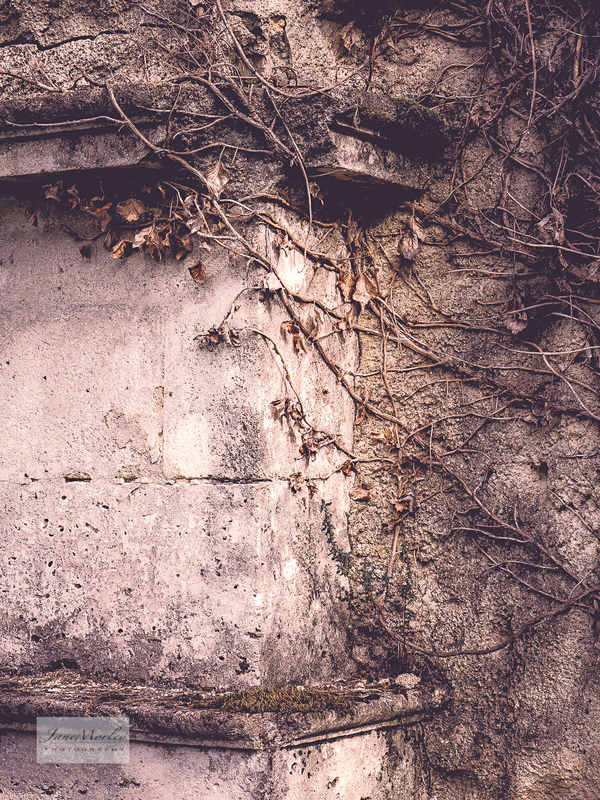 Your very own ruin – how cool is that? I would leave it as is!! 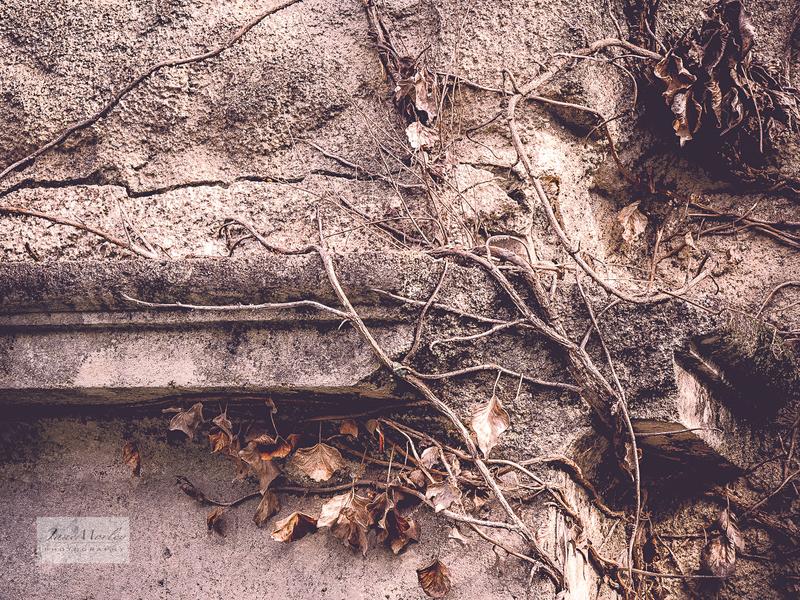 Ivy is no friend to bricks or stone…. Too bad the restoration plans collapsed with the roof, but you still have a really cool ruin. It’s beautiful just as it is!! 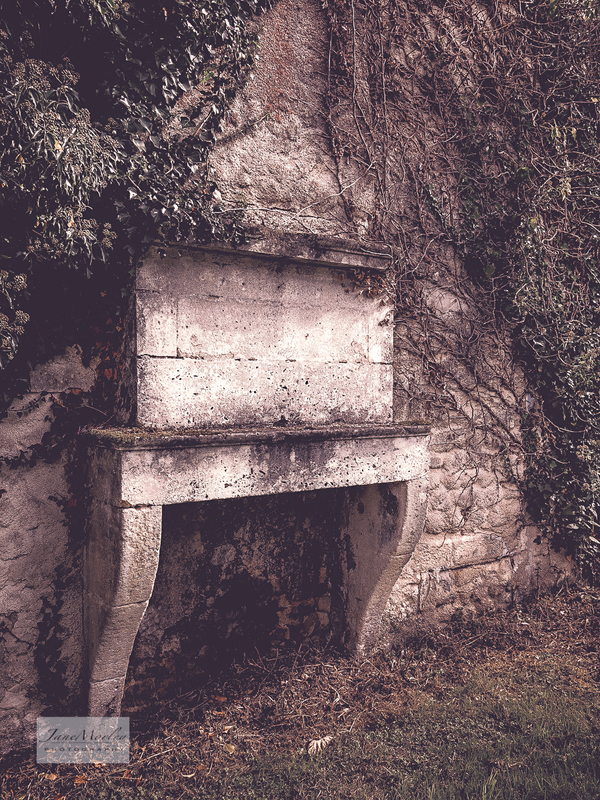 Do you know why a fireplace was built on the outside? Maybe another building attached? I like the muted colors of the photographs. Hope you’re staying warm there with winter advancing so quickly. We’ve had a bit of snow here already in the U.S.
Hi Beth, Glad you like my ruin! Yes I think there was another building there at one time. 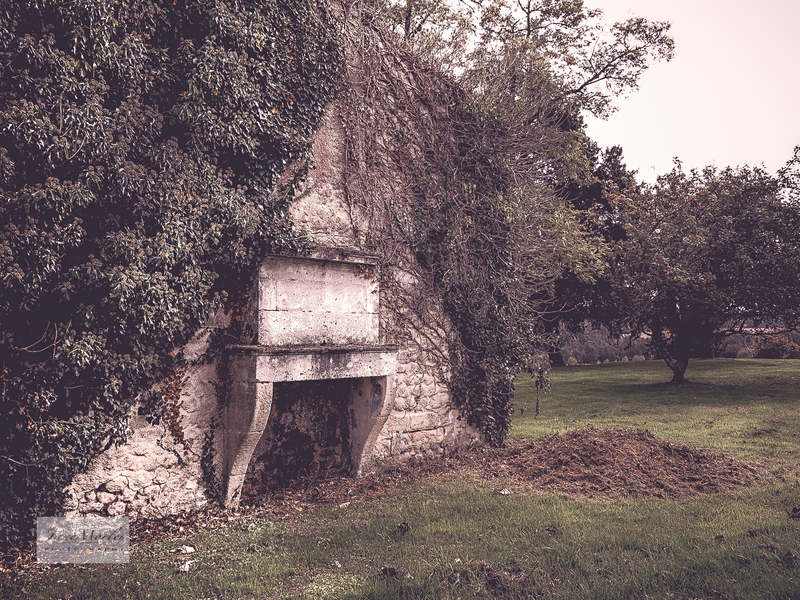 I’m pleased to say our house is in rather better repair than the ruin but it’s definitely getting cooler here now – we don’t often get snow but the wood burners are now lit in the evenings that’s for sure! A beauty of a fireplace , indeed! The optimist in me sees that all it needs is a home! Quite so facetfully! I’m glad you like it! We originally thought it would make a very cool area for outdoor eating, barbecue, terrace that sort of thing, you never know one day it may happen! I like those creative ideas. Hi Kaz! It is a little surreal isn’t it! There was certainly another building attached at one time, I believe a family of 7 lived in it in the 1950’s! Yes indeed Kaz! I hope we can restore this place – the whole place not just the cottage – to something resembling it’s former glories back in the 1800’s – still such a lot to do! I wish I’d been taking photos when we started Kaz, at least anything we do now I can record but we need France to move out of recession before we can do anything major for a while! We keep plugging away bit by bit though! Exquisite. I’m moving in and you can restore around me! But I’d want to keep the ivy – I could then imagine I’m playing Peter Pan at the Scala! Well yes that’s true I hadn’t thought of that – but we might have to treat you for greenfly once in a while too ! Hi Jane, this looks like Sleeping Beauty’s estate complex. Also make me remember of paintings by artists centuries years ago I saw — my poor knowledge, my only reference of Europe culture — Louvre n Stadelmuseum Frankfurt that I enjoyed there very much. HaHa Saxon, I’m not sure anyone can help with this one! Maybe one day….. Nice idea for the Italian village, perhaps a lottery win or a gold strike is in order? !